Last night decided to try grilling pork chops for the first time in my life. That sounds, wrong, doesn’t it? I’ve never grilled pork chops? Could that possibly be? Guess so. I turned to Steve Raichlen’s How to Grill: The Complete Illustrated Book of Barbecue Techniques . It’s the first grilling/barbecue book I ever bought, back in the day when I bought my first smoker. If you’re just starting out–even if you’ve been doing this awhile–I highly recommend it. Basically, the recipe calls for 3 tablespoons salt, 3 tablespoons brown sugar dissolved in hot water. Then that mixed with 2 cups cold water and 3 tablespoons bourbon. After it cools down, chuck the chops into it (I put it all in a Ziploc bag) and let sit for a few hours. When ready to cook, take ’em out the fridge, let ’em hit room temperature and pat ’em dry. Raichlen suggests indirect heat/smoke for the first 20 minutes, then grilling on high heat to get those pretty sear marks. I gave that a whirl. Put a box of wood chips in the gas grill, let it get hot, turned the burner off under the GrillGrates and put down a layer of foil, then the chops. Those GrillGrates hold a hell of a lot of heat and even without a direct flame under them radiate a lot of heat. 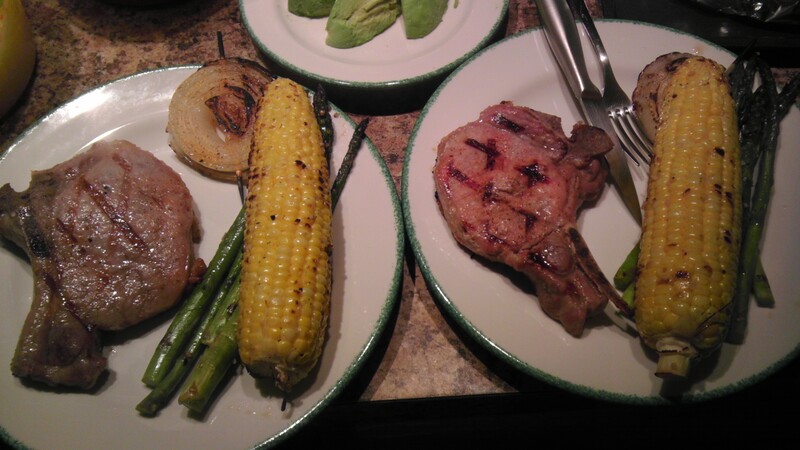 The chops were done with the “smoking” portion of events in 15 minutes, so I yanked ’em, cranked the heat, then seared ’em four minutes aside directly on the GrillGrates (rotating 90 degrees at the 2 minute mark for the cross-hatching). How’d they turn out? Excellent. Then again, I’m starting to suspect if you brined shoe leather it would come out good. If you’re dealing with dry meat like turkey, chicken breast or pork chops, USE A BRINE. FYI, the onions? Slice an onion, skewer it, brush with olive oil and dust with your favorite seasoning (I use Tony’s) and just put on the grill until charred. That’s some good eating. Not too bad for the first shot. Good call on indirectly cooking the meat. Last night my wife and I made ribs using a similar process. First, cook the ribs for 2-3 hours on low heat (200 degrees). Then throw them on a really hot grill for 15 mins to get the nice crispy outside.